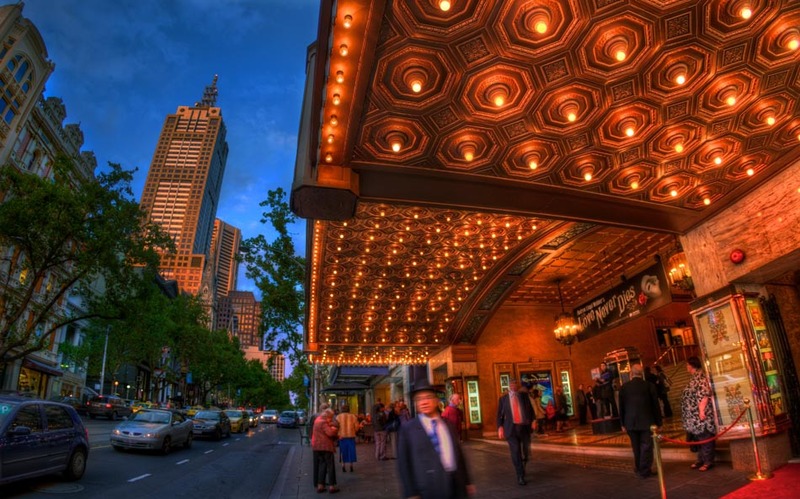 While making this Gallery of Melbourne in HDR, Photographer Craig Sillitoe found inspiration in the photos of Ansel Adams. PHOTOGRILL: Which photographer inspired you to make these images? 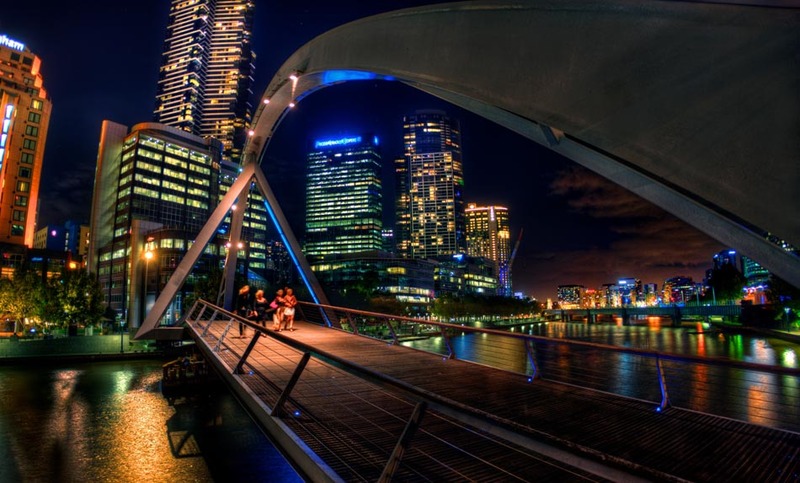 PHOTOGRAPHER: I was on Princes Bridge with camera on tripod making boat loads of pictures when a passerby asked me if I’d seen the work of Ansel Adams Little did he know, that was a opening for a long conversation. Ansel Adams was an artist who inspired and challenged me as a young photography student. I was mesmerised by the beauty of his B&W photographs of Yosemite National Park, which inspired me to spend many months learning and implementing the ‘Zone System’. Adams created the system in 1940 by careful observation of the relationship between exposure and processing. His images exhibit a depth of rich detail that you could fall into, that’s what the system does. In between pitch black and pure white the human eye can see a very wide range of tones. As wide as 16,000:1 or 14 f-stops. Some of the scenes Adams photographed exhibited a tonal range as wide as that, yet in some scenes the tonal range might have been only 128:1 or 7 f-stops. Adams realised that in order to create images that exhibit detail throughout the print, the tonal range of his film would need to exactly match the that of the scene. He’d also learnt that if he over-exposed his film, but under-developed it, he would extend the range of tones that were recorded. By under-exposing and over-developing, the films range is contracted. So for each photograph he took, Adams spot metered many points within the scene and determined on a chart what the optimum exposure and development combination would be. Beginners who really want to learn photography can benefit by going fully manual. The zone system is about as manual as you can get. PHOTOGRILL: Did you use Adam’s zone system to make these images? 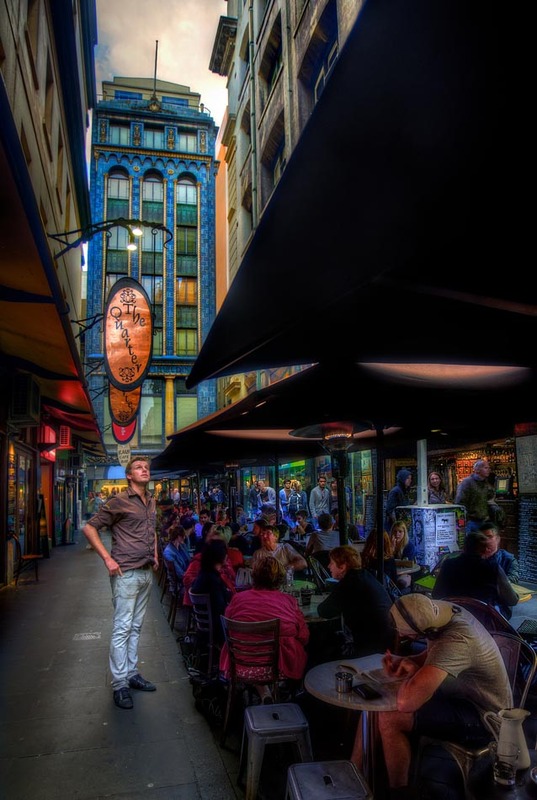 PHOTOGRAPHER: I used High Dynamic Range or HDR photography. It’s the digital age equivalent of Adam’s zone system (despite the fact that HDR was first used in the 1850s). Digital cameras have a dynamic range around 2000:1 or 11 f-stops. Yet some of the night scenes I photograph have a tonal range of 130,000:1 or 17 f-stops. Digital cameras can’t be made to extend their tonal range the way B&W film can, so in order to faithfully record all the tones in a scene HDR uses multiple exposures at various shutter speeds. I take advantage of the camera’s auto exposure bracketing which quickly makes a sequence of pictures of various exposures before the scene changes. The goal is to make three or more images of a scene, where the only difference is the brightness of the image. In post-processing I use Photomatix Pro software. 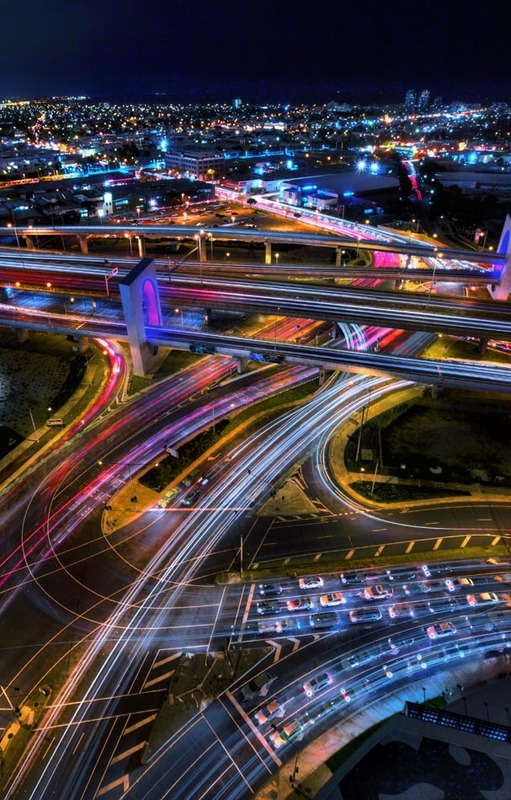 It blends the tones from the various exposures into a single HDR format image. HDR images themselves contain the full range of tones, 130,000:1 or more. It makes for some pretty large file sizes. But the images cannot be reproduced by an LCD screen, or in print. So once the tones are blended they must be compressed to an LDR image, in order to fit the range of the display medium. 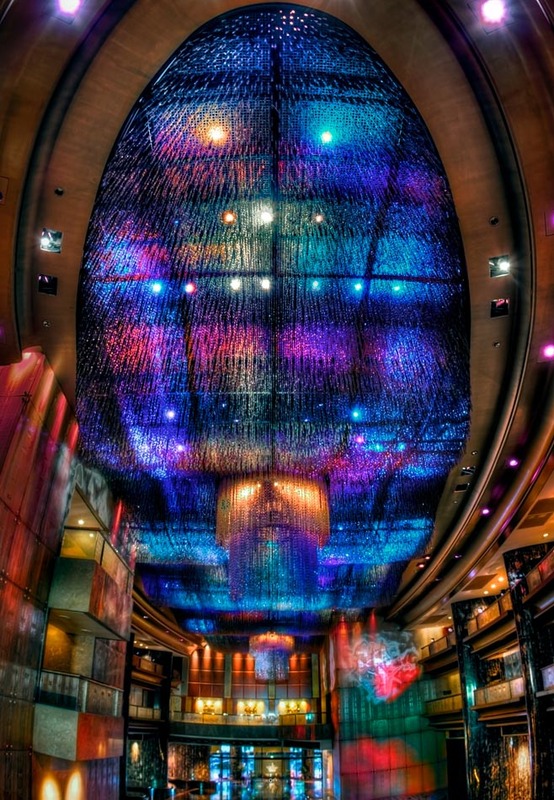 Photomatix has a whole host of ways of converting an HDR into an LDR image. Which is important because that level of control is what allows me to be really creative with HDR. Without HDR many of the images here would be 60% pure black or pure white tonelessness. Of course those toneless areas would also be colourless. So HDR allows me to recreate the full experience of a scene, every tone and colour. I lean toward photographing scenes that are very challenging for normal digital photography. Night scenes, with deep darks, broken up by bright lighting. Indoor scenes with views of outdoors or vice versa. Contre-jour images, including the sun in a wide scene is bound to make it difficult to record, yet how often is a great moment in life enhanced by the warm feeling of the sun on our faces? HDR photography allows me to capture scenes that are fantastic to experience, but that often end in disappointing images that can’t be saved with photoshop. 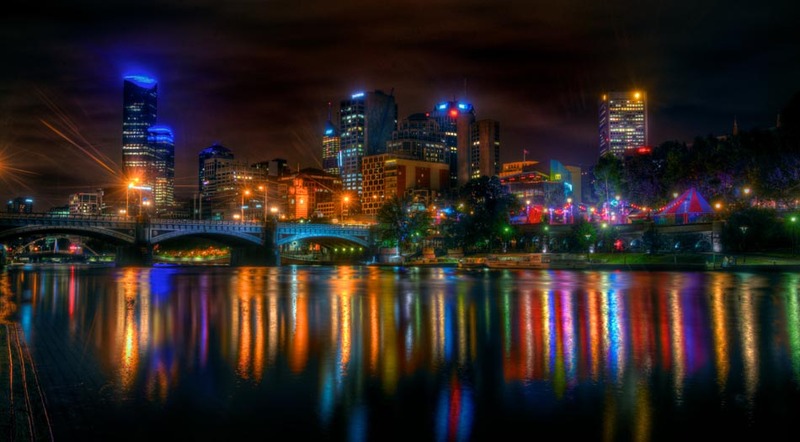 PHOTOGRILL: Is HDR a problem for photojournalism? 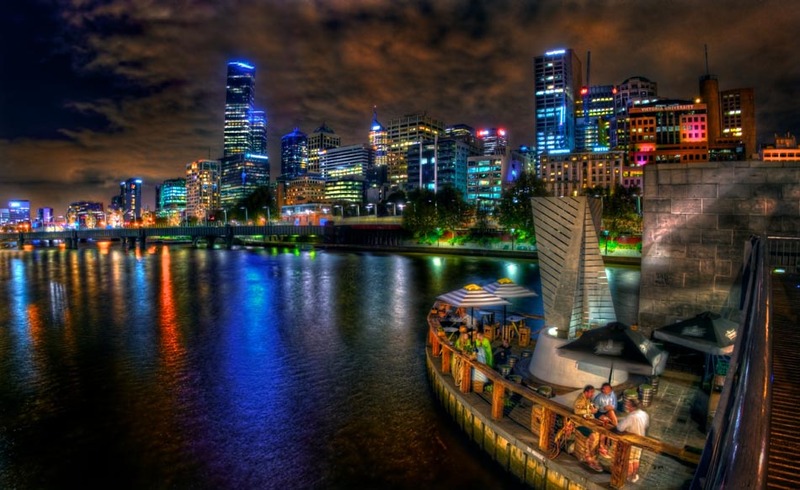 PHOTOGRAPHER: HDR presents an interesting philosophical problem for a photojournalist. 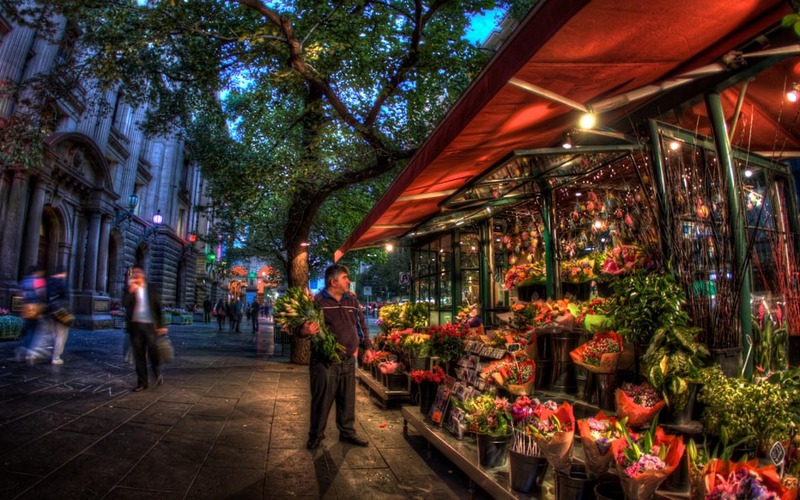 In the photograph of the flower seller at his stall outside Melbourne town hall, several people are walking by to the left. I made three bracketed photos of this scene in quick succession which, when blended together looked like a scene from an episode of Fringe, body parts were blended together in a horrifying fashion. To fix this I could’ve waited till there were no moving people, but instead I was able to select just the part of the picture with moving people, and use only a single image in that area. The obvious question is, does that make it a faithful reproduction of the scene, or would it be a more faithful rendition if I was to wait for all subjects to be still before making my photographs? Or what if I was to forgo most of the tones and colours in order to capture the scene in a single image, would that be more natural? I sometimes imagine myself with responsibilities resembling those of a medical doctor. Perhaps in the absence of a natural solution I must be entrusted to manipulate a situation using professional judgement, to get the outcome that’s most natural for the viewer. There are iphone apps that make crude HDR images with a single click, perhaps in the near future other digital cameras will do this as well and the dilemma will become just a part of history. Street photography is one of my favourite forms of photojournalism, it is pure documentary of a city, it’s people, the times and fashions, expressions and movements. In a few short years many changes take place within our city. Street photo art is like a great wine that gets better with age. My goal is to make images that are rich in content, with many interesting things going on at once, expressions and movements, fashions, the colours of the time, what people are doing, what the city looks like and so on. I used a tripod for many of the night scenes, but during the day I’ve found that I can make street photographs in a way that I never could by making HDR images with a hand-held camera. 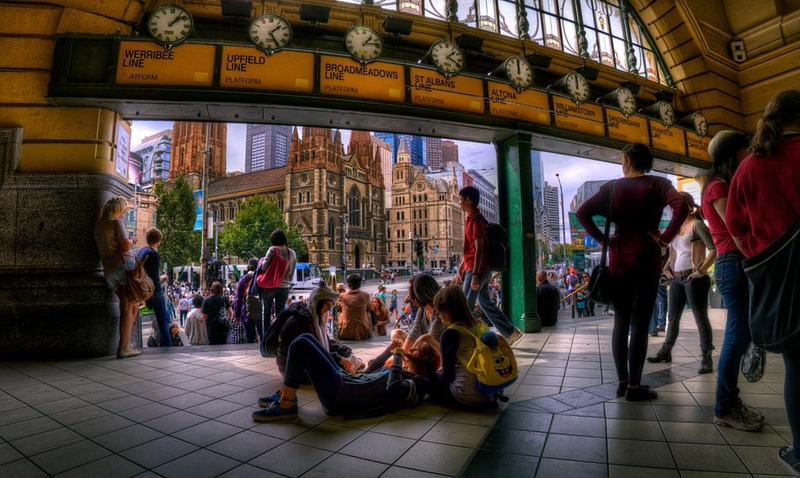 For example the image if the clocks at Flinders Street station from the inside looking out to St Paul’s Cathedral with busy people everywhere. It’s a scene that’s been imbedded in my own memory since earliest times, yet I have never been able to capture it to share, until now. 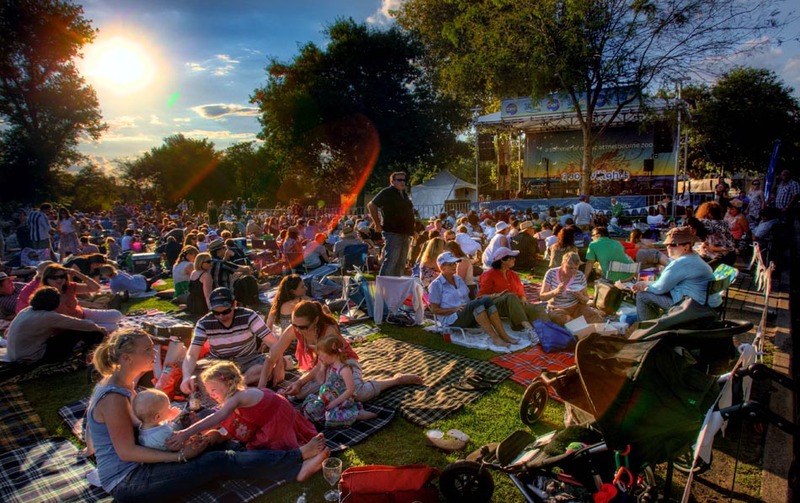 Another example is the contre-jour image of families preparing for Melbourne Zoo Twilight Jazz. I’ve observed many scenes like this one but until recently I wouldn’t waste my time picking up the camera. Because the more beautiful the scene, the greater the disappointment for me when I fail to get it. Creating a photo essay of images because they were all made using one technique is a bit un-natural I must admit. I should use my tools to support my goals, not the other way around. Yet it’s a high dynamic range world that I was born into, and that’s where I feel truly at home. 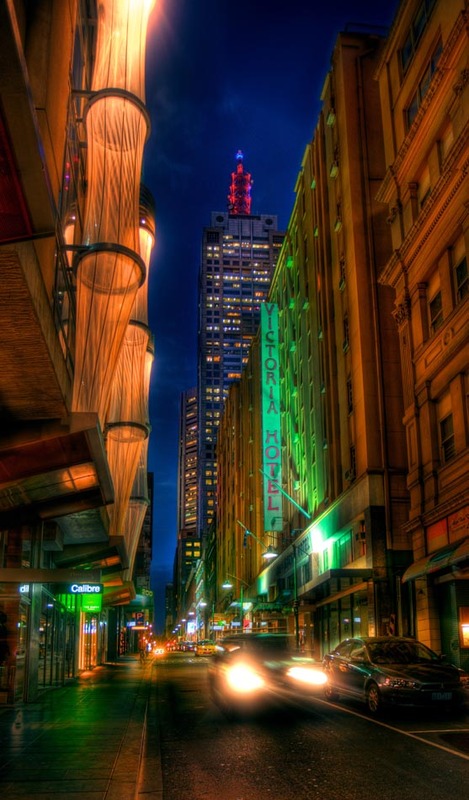 This entry was posted on Wednesday, August 10th, 2011 at 10:42 pm. It is filed under Fairfax Photographers, The Grill and tagged with Creative Photography, People, Photographic Techniques, Photojournalism. You can follow any responses to this entry through the RSS 2.0 feed.